As announced last month, the team of volunteers will be off to the village of Invancea, Moldova to challenge themselves with toilet installations in the village school. Before they get going, some volunteers have already started actively raising money with quiz nights and skydiving and others are doing brilliantly raising sponsorship through MyDonate. 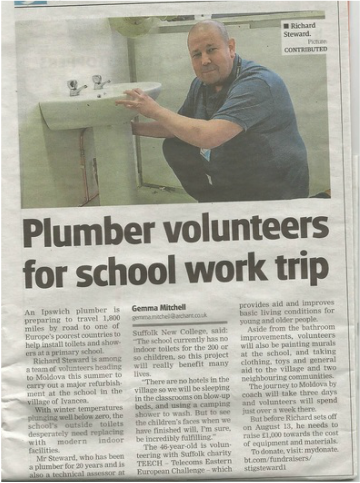 New volunteer Richard Steward is joining the team to help with the plumbing and managed to get an article in the local newspaper to spread the word and look for further support. See below for further information on these ventures. Please be aware that all places for the 2016 Summer Project trip are now full. Volunteer Dave Astbury organised a quiz night on the 18th March to raise funds for TEECH. The picture at the top of the page shows that he had a good turn out. Over £797 was raised, an excellent amount. TEECH would like to thank Dave for his extra effort to raise funds. ​Volunteer Charlotte Adams is jumping out of a plane on the 25th March to raise money for TEECH. Charlotte will be joining the team for the first time this August as we head to Ivancea. We wish Charlotte a fun fall from the sky and good luck with all her fundraising. Volunteer Stig (Richard) Steward is also full steam ahead raising funds and promoting this years trip. Stig will be bringing his plumbing skills to the team in August and hit the news recently to spread the word. The next packing date is Saturday 16th April. If you would like to donate to TEECH or sponsor one of the volunteers then please do so using the button to the left.